While watching the birds at the feeders in Prospect Park on Sunday I heard a couple of blackbirds call to each other as they flew overhead. I was pretty sure they were Red-winged Blackbirds but I wanted a look to make sure so I grabbed my stuff and followed to where I was pretty sure they had landed. Sure enough, they were Red-winged Blackbirds, but I was much more impressed with the male Yellow-bellied Sapsucker I found sunning himself about seven feet up on the side of a tree. It was a very cold morning and he was all fluffed out and virtually motionless, only moving his head when a jogger went by or when I moved to a different location for another angle from which to photograph. He didn’t look so energetic, but then, how could he be? Sap doesn’t flow very well (I would imagine) when temperatures are extremely low, and maybe he was regretting settling in Prospect Park for the winter instead of heading for warmer climes. 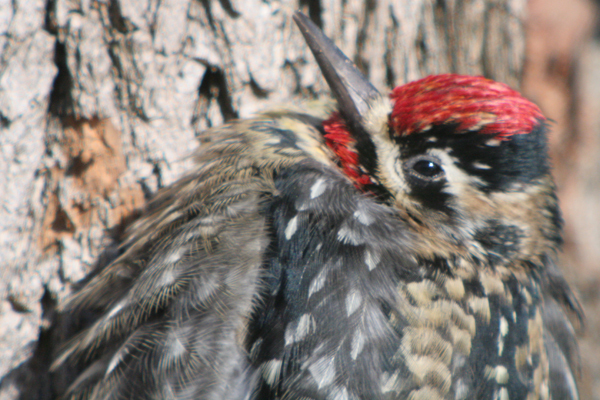 By the way, it is the sapsucker’s red throat that indicates that it is a male: a female Yellow-bellied Sapsucker would have a white throat. It was fun to have such a cooperative subject for digiscoping though I almost wished he would move around a bit more so I could have gotten more of a variety of poses (and so I wouldn’t have to resort to shots like the one below to give a different kind of look at the bird). This post has been submitted to Bird Photography Weekly #21. Go check it out! dude where are my picts? Look at all the color and textures! Sunning is such a different observation. They are seldom still when I see them. I love the way a digiscope captures those tiny details. @Dawn: Either that or very foolish! @Pam: Hold your horses…I’ll email some over later. 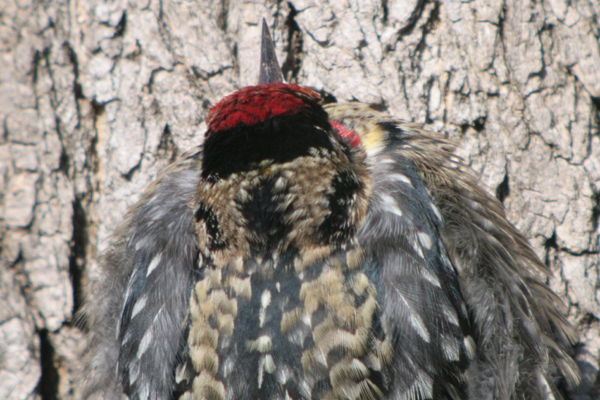 @Vickie: I must say that I have become quite the fan of digiscoping myself. Could you have been any closer? Wow! Sapsuckers are such fun birds! 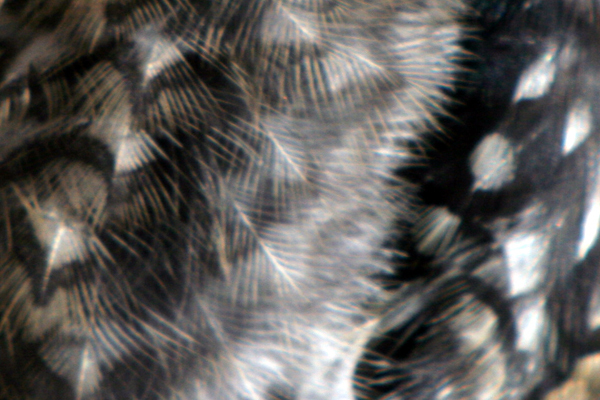 I love their feather Patterns! nice shots. It looks a bit sleepy!! Great photos! You are magic with that digi-scoping set-up! Nice close-ups! I love Yellow-bellied Sapsuckers, they are great to watch. Great close up shots of the plumage. Poor little chap did seeem a little cold. Incredible pics Corey- I’m so envious of your equipment (Swarovski). I think I may have had one of these in my backyard- going to have to get a closer look, I originally thought it was a red bellied woodpecker- none the less beautiful bird. Super pics of the Yellow-bellied Sapsucker Corey! I appreciate the different angles, especially the back of the head shot. Nice to see the different feather patterns. What is your digiscoping set up? @Liza Lee: I actually had to stay back to get more of the bird in the frame. I would have backed away further but I didn’t want to go off path. @Mon@rch: I like the noises they make. @Tamatha: They are gorgeous. Let us know what your bird is. @Larry: I’m using my Canon EOS 20D with a 50mm lens attached to a Swarovski STS 80 HD scope. The adapters that link the two together are all Swarovski as well. I love it! Great shots!!! I haven’t seen a YB Sapsucker yet this year and as for the Williamson’s…I have chased that bird up and down Arizona and New Mexico to no avail. 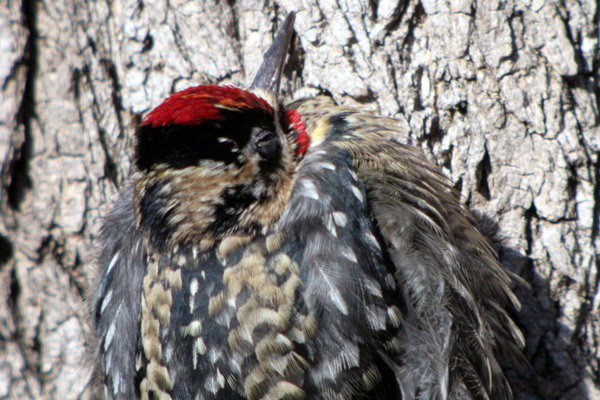 If you want some really great sapsucker photos – not that these are inferior – and not taken through a spotting scope, give me a shout! 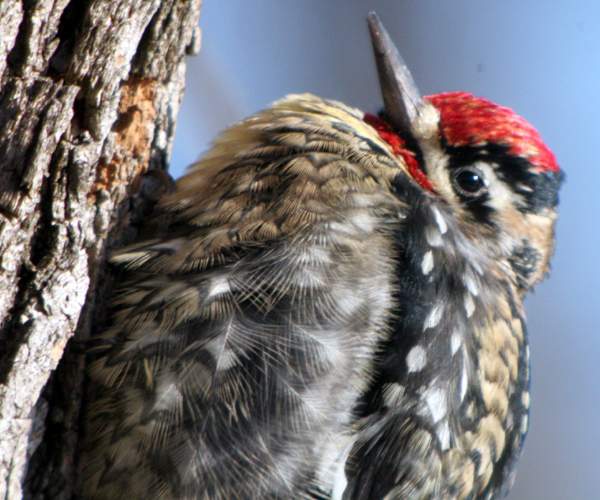 In regards to the yellow-bellied sapsucker and the lack of sugary tree sap during winter, this lovely bird’s winter diet is primarily soft mast (even poison ivy and red cedar berries) and hibernating insects. It’s one of the reasons these birds migrate southward from much of their summertime breeding habitat. Their mewing calls are a true harbinger of cold weather in my home state of Virginia.